Kokoist is a stop of the line soft gel with Japanese origin. Kokoist is named after a famous nail technician in Japan,Koko Kashiwagi, who started her own gel line after many years of experiences using a variety of systems. What makes Kokoist unique? The quality of the soft gel. I have had different gel systems but this one requires experience and skill. I noticed while Don was adding the soft gel polish he used a precise technique to make sure the gel was even. He has mastered the Kokoist soft gel and the delicate texture that will provide outstanding results. The results are impeccable. I requested a ballerina shape for my nails. 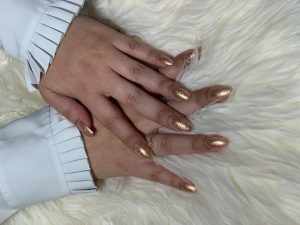 Have you ever requested a shape that requires clean edges and at the end of the manicure when the gel color is applied the sharp edges round out and lose the shape you requested? Kookiest is for you. This soft gel polish leaves your nails looking very natural. The coats are thin yet very potent. The color and the feel of the gel are very natural. I have been wearing this gel color going on two weeks and it hasn’t lost its shine or opacity. If you feel like truly treating yourself to a top of the line, natural finish gel color, choose Kokoist.